The paper aims to explore and analyze Henry Bauchau’s Prométhée enchaîné. 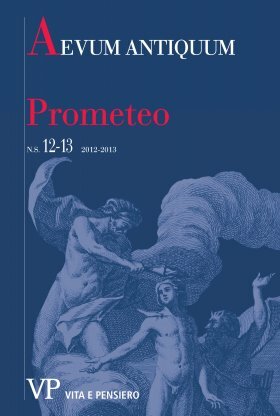 This ‘free adaptation’ of the ancient drama was first performed in 1998, and it constitutes an interesting chapter of contemporary rewritings of the Promethean myth. In the first part of the essay the modern text is compared with the stylistic and formal structure of the Greek drama: metrically uniform in lyric parts (but far from the variety of the model), it perfectly follows the plot’s development of the ancient text. Nevertheless some hints and some clues (passages freely translated or added sentences) reveal to the audience and especially to the reader a precise reappropriation of the ancient theatrical version. The Belgian psychoanalyst and writer reshapes the nature of the relationship between Zeus (designed as «Le Père») and Prometheus, who prophesizes a forthcoming time when this violent god, this «Grand Séducteur», will be transformed into a compassionate and partly Christianized one.